Tipaimukh dam has become a major concern for the people of Manipur and Mizoram and also a controversial political issue between India and Bangladesh. With India and Bangladesh sharing 54 rivers amongst them water has always been a point of contention between the two. The rock filled hydro electric dam to be located on the border of Kolashib district of Mizoram and Churachandpur district of Manipur near the confluence of Tuivai River and the Barak River has met with a lot of resistance on both sides of the border with a slew of objections from the Bangladeshi side as well as protests from the North Indian states. The 163-meter dam has sparked controversy over India’s failure to provide public consultations and information sharing with both Bangladesh and indigenous communities. The Indian state-owned utility North East Electric Power Corporation Ltd. (NEEPCO) originally built the dam to control floods but now plans to generate electricity with the dam, which has a capacity of 1500 MW. Most of the electricity would be sold to cities outside the region. According to the Sinlung Indigenous People Human Rights Organization (SIPHRO) of India, “the process for choosing [the project premises] ignored both the indigenous people and the recommendations of the WCD. 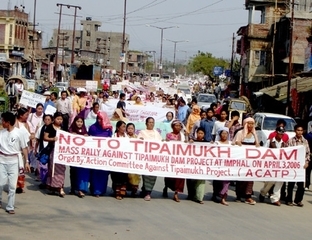 Despite the countless petitions by affected people, rallies, and sit-ins protesting the project and India’s lack of meaningful public consultation, environmental clearances have been given by the Ministry and the Manipur government. Project Details The dam on the Mizoram-Manipur border is expected to generate 412 MW of hydel power and tame floods in south Assam. The proposed dam will be 163 metre high and will submerge at least 275 km2 of land. Development of Alternatives As the area is earthquake prone, all kind of large dam construction should be stopped. Why? Explain briefly. 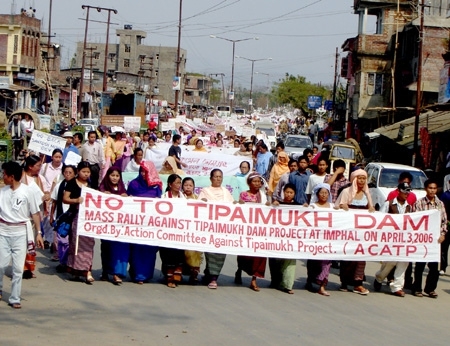 The Tipaimukh Dam Affected People’s Association in Mizoram has warned against any move to build the Tipaimukh dam as a newly constituted India-Bangladesh sub-committee is preparing to give the long-stalled project a fresh impetus. The Bangladeshi civil society groups, media as well the opposition parties have come out strongly against the project especially after the signing of the Promoters Agreement and have put pressure on its government to take up the issue with India. Although India has assured Bangladesh that it would not have any adverse impact on the country but a strong sentiment against the dam is already prevalent there. Government of India also invited group of Bangladeshi experts to survey the proposed dam. India on its part has been giving repeated assurances to Bangladesh about the safety of the project and it not adversely impacting it in any way. Tipaimukh features in the Joint Communiqué that was signed between India and Bangladesh during Shaikh Hasina’s visit in 2010. The Indian government in the 37th meeting of the Joint Rivers Commission in March 2010 gave the assurance that they would not take any step under the Tipaimukh project that might harm Bangladesh. The Indian PM during his September 2011 also gave the same assurance.